Nearly everyone these days is looking to save more money and earn more money, too. While staying on top of financial goals can be overwhelming, there are companies that offer critical data, information and guidance to help a consumer keep of track of their finances. That includes Money Dashboard. The Edinburgh, Scotland-based website was founded in 2010. “The mission is to help UK consumers make their money go further by empowering them to make informed financial decisions,” said Sean MacNicol, engagement manager for Money Dashboard, who spoke to RewardExpert. Besides its desktop site, Money Dashboard is also available on mobile, iOS and Android apps. 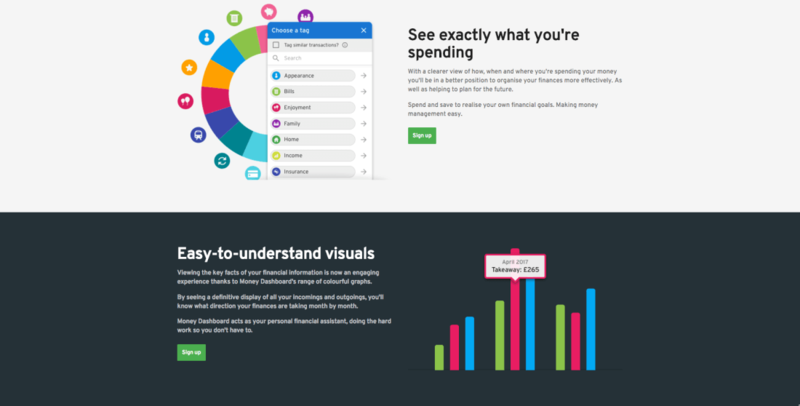 Money Dashboard offers a user a true account of their financial situation. “Our free Personal Finance Assistant integrates all the user’s current accounts, credit cards and savings accounts into one secure app that then shows them exactly where their money goes,” said MacNicol. “Consumers are increasingly benefiting from banking with multiple institutions as they go in search of better interest rates on savings accounts and additional benefits from credit cards. The time and hassle involved in logging in to each individual account to retrieve information simply isn’t efficient, and that’s where Money Dashboard comes into its own.” In addition, most transactions and balances are grouped by spending category, such as bills, entertainment and insurance. Account balances are also refreshed daily, so the most up-to-date information is available right at a user’s fingertips. While users like Daniel show what’s possible with Money Dashboard, there is no doubt that saving enough money is a challenge for people no matter where they live. In the United States, the personal saving rate hovers around 5.7%, according to government figures. And it’s much the same in the UK. “Twenty-one million UK adults have less than £500 in savings, leaving them unprepared to deal with unexpected bills or payments. Nineteen million don’t have an approach to budgeting that they feel works, and four out of 10 do not feel that they are in control of their finances,” said MacNicol. That makes companies like Money Dashboard, with their ability to help a user make informed financial decisions, all the more important. That includes playing a role in legislation involving Open Banking, which goes into effect in January. “The UK personal finance market will see radical change and growth starting in January 2018, meaning consumers will have access to a huge range of third party apps that they can authorize to help them manage their finances in different ways,” said MacNicol.